Allowing CO in reproductive healthcare, even to a limited extent, creates a fundamental contradiction and injustice. The patient’s rights to life and bodily security surely outweigh the healthcare worker’s right to conscience, whose first obligation is to their patients, not themselves. The exercise of CO allows medical professionals in a position of authority to abandon dependent patients whom they are duty-bound to serve. Health systems that prohibit staff from providing abortion or contraception services are being allowed to systematically deny healthcare services to a vulnerable population and disregard conscience rights for abortion providers, as well as patients. Since women are the vast majority of patients in reproductive healthcare, CO rises to the level of gender discrimination. 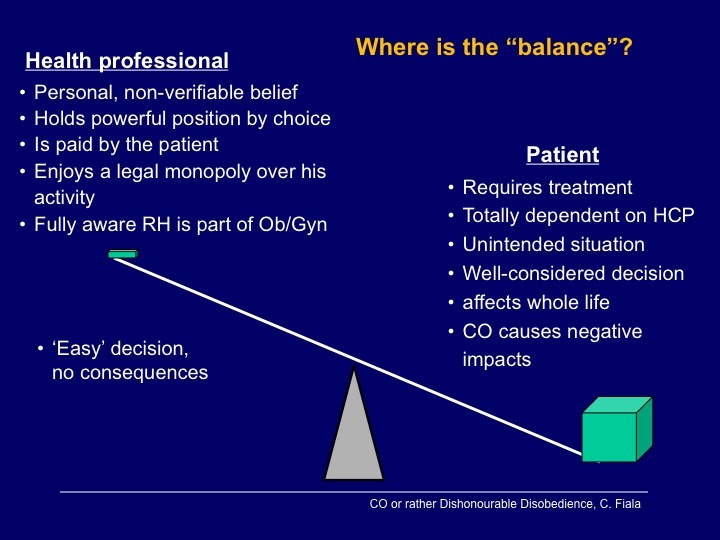 The systemic abuse of CO will inevitably occur as long as CO in reproductive healthcare continues to be tolerated. Further expansions of CO cannot even be opposed with evidence-based arguments, because the provision of healthcare has become contingent on religious or personal beliefs. Healthcare workers’ refusal to participate in reproductive care such as contraception and abortion is not a ‘‘conscientious objection;’’ rather, it is a refusal to treat that should be seen as unprofessional. A just society and an evidence-based medical system should deem it as ‘‘dishonourable disobedience,’’ an ethical breach that should be handled in the same way as any other professional negligence or malpractice, or a mental incapacity to perform one’s duties. Unless workers are able to adopt an attitude of professional distance that would allow them to deliver necessary healthcare with which they personally disagree, they should quit the field of reproductive healthcare, or not get involved in it at all. In fact, those two options represent the only honest exercise of CO in medicine. The state’s acceptance of CO in reproductive health contravenes women’s legal right to access health services. As such, CO can be seen as an attempt to claw back the legality of abortion (and contraception) and return women to their traditional duty of producing soldiers and citizens for the state. By manipulating women into continuing an unwanted pregnancy against their best interests, the exercise of CO undermines women’s self-determination and liberty and risks their health and lives. As such, it has no place in a democratic society.